An all-new, all-ages series full of magic and whimsy from award-winning creators Eric Shanower (Adventures in Oz) and Gabriel Rodriguez (Locke & Key)! Spinning out of Winsor McKay’s brilliant early 20th century strip, Little Nemo in Slumberland sees King Morpheus’ daughter, in the Royal Palace of Slumberland, select her next-playmate: Nemo! Only Nemo has no interest in being anyone’s playmate, dream or no dream! I kind of went all nostalgic with this graphic novel. I remember loving the movie Little Nemo Adventures in Slumberland when I was young and I remember spending hours playing the video game with my brother. This is a continuation of the older Nemo (main character is not the original Nemo but a boy named Jimmy with the middle name of Nemo) story and I found it to be a cute adventure that I think children would like. As an adult I personally enjoyed it for the messages it sent to kids ( or what I perceived the messages to be), nostalgia reasons, the artwork was vibrant and well done, and it was a cute little adventure. 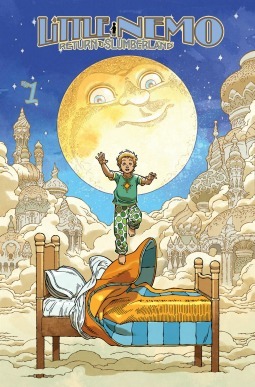 Yet, as an adult I found the story at points boring ( especially the beginning where he’s trying to get into Slumberland. I mean I understand perseverance and everything but sheesh I thought it was a little drawn out. Once I got about half way through I thought it picked up the pace more and I enjoyed it more. I personally give it 3 Stars for the cute adventure, nostalgia and the beautiful artwork. But! I read this with my 5 year old son and he loved it!